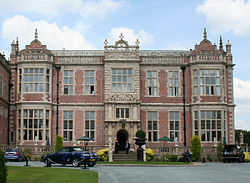 Hatfield House, built in its entirety by Robert Cecil, 1st Earl of Salisbury, between 1607 and 1611, is an example of the later extension of the Elizabethan prodigy house, with turreted Tudor-style wings at each end with their mullioned windows but the two wings linked by an Italianate Renaissance facade. This central facade, originally an open loggia, has been attributed to Inigo Jones himself; however, the central porch carries a heavier quasi-gatehouse emphasis, so the attribution is probably false. Inside the house, the elaborately carved staircase demonstrates the Renaissance influence on English ornament. 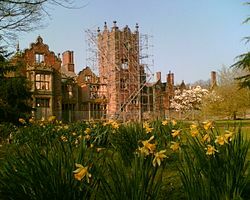 Examples of original Jacobean architecture in the Americas include Drax Hall Great House and St. Nicholas Abbey, both located in Barbados, and Bacon's Castle in Surry County, Virginia. This article incorporates text from a publication now in the public domain: Spiers, R. Phene (1911). 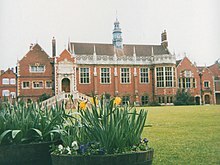 "Jacobean Style". In Chisholm, Hugh (ed.). Encyclopædia Britannica. 15 (11th ed.). Cambridge University Press. p. 115c. This page was last edited on 4 March 2019, at 11:52 (UTC).